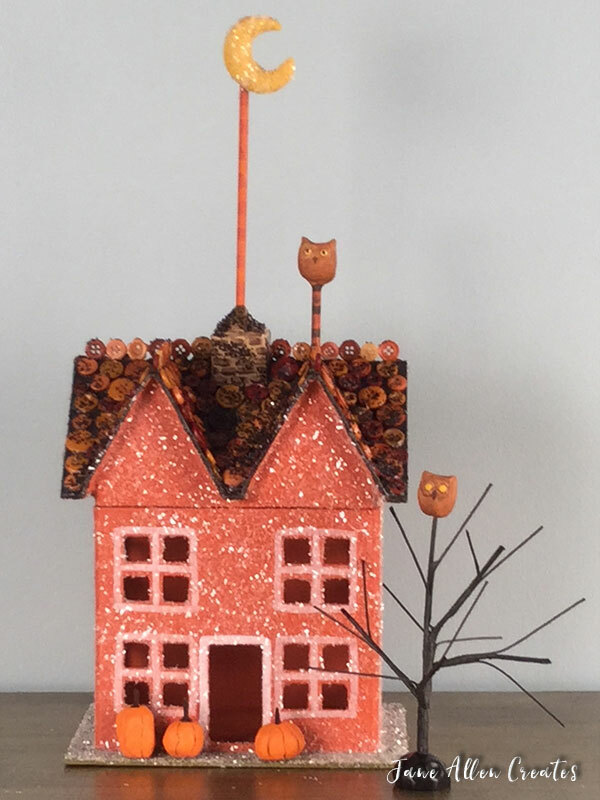 For my second Fall Glitter house I had visions of an orange house with a black button roof and pumpkins on the doorstep. So I started with a Medium paper maché house from Hobby Lobby. I painted the house (using DecoArt paints) Persimmon, the roof Bittersweet Chocolate and the grass Antique Green. I used my Faber-Castell white pitt pen to paint around the window and Bittersweet Chocolate and a small flat to paint the bricks on the chimney. I then painted a little wash of Bittersweet Chocolate on the chimney. If I had it to do over I might have gone around the windows with Soft Black or a black marker. So now to add the buttons to the roof. I wanted black but they were sold out of them at Joann’s so I found this nice assortment of orange buttons. Since I am not putting snow on the roof I attached them using Super Glue. Notice how the buttons on the top of the roof are standing on edge. I love how that looks – it gives the house a Victorian look. My art student Daniel helped with this project. We wanted a moon on the roof and also decided to put an owl on the roof. For the moon and the owl we used Quikwood. Quikwood is a two part resin. Once you knead it together it will set in twenty minutes. To do the moon we cut about a 1/2″ of Quikwood, rolled it into a tube with the ends smaller and then laid it on a piece of parchment paper to make a C shape. To make the owl we also cut 1/2″ of Quikwood and rolled it into an oval. We then pinched the top corners to form the ears. We pushed the bottom of a small wooden flower pot to form the eyes and used a knife to form the beak. Before the owl was set we placed it on a 3/16″ dowel stick about 4 inches long. We used more Quikwood to attach the moon to another dowel stick about 9″ long. Smooth the Quikwood on the back if needed Use DecoArt Extender. Allow them to set. Once they are set drill holes in the roof of the house and secure with Quikwood. We also created a second owl and placed him in the top of a premade tree purchased from Michaels. Our pumpkins were also made from Quikwood. Again we used about a 1/2″ for each pumpkin. We shaped them, added a whole clove for the stem and then used a knife to put the sections on the pumpkins. We then painted the pumpkins Spice Pumpkin. The owls were painted Raw Sienna, with Spicy Mustard Eyes, Soft Black centers and a White highlight. The moon was painted Spicy Mustard. The stick to the moon was painted Spice Pumpkin with Persimmon stripes and the owl stick was painted Persimmon with Bittersweet Chocolate stripes. I wanted to tone the roof a little so I covered it with white glue and then lightly sprinkled Black glitter over it. I allowed it to dry before glittering the rest of the house and the moon. I then glued the pumpkins into place. Hope you enjoyed this fun fall glitter house. And if you are wondering about those trees, we will share them in another post. Darling clever little houses . Darling Jane and I love seeing Daniel creating! Keeping the love of art alive! Love seeing you teaching younger generation keeping the love of art alive! ❤ the creativity and your helper did a wonderful job as well! Thankyou,Sandy, it is more fun having a helper. Have you painted your house yet? I have not done mine, but want to get to it.